"Among those protections is the condition that NSA can query the metadata only based on phone numbers reasonably suspected to be associated with specific foreign terrorist groups," Alexander wrote.Sanders, I-Vermont, had written to Alexander earlier this month asking whether the NSA is currently spying "on members of Congress or other American elected officials" or had in the past. An NSA spokesperson gave a general response to the inquiry at the time, saying that "members of Congress have the same privacy protections as all U.S. persons" and that they were reviewing the senator's letter. Alexander's letter, which was personally addressed to Sanders, was more specific. Sanders has publicly questioned the legality of the NSA surveillance programs recently, calling them "a clear violation of the Fourth Amendment ban on unreasonable searches." 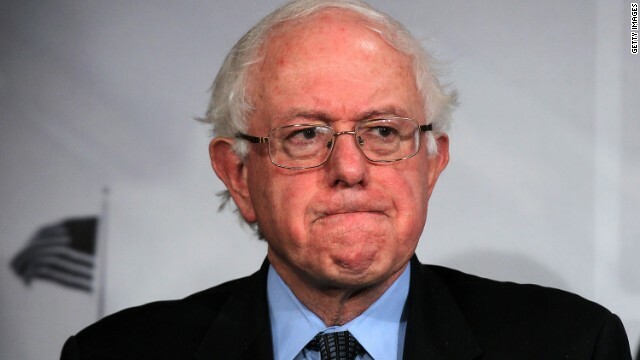 When asked about the balance between civilian privacy and counterterrorism surveillance earlier this month, Sanders told CNN: "We have to be vigorous in protecting the American people from terrorism. But I very strongly believe we can do that in the context of the U.S. Constitution. I believe what the NSA is doing now is not constitutional." The push back against the possible surveillance practices of the NSA has created unlikely bedfellows in the Senate, with tea party favorite Sen. Ted Cruz, R-Texas, suggesting the methods of data collection have "not been effective enough monitoring and surveilling bad guys" but rather "too broad with respect to law-abiding citizens." Cruz added that the NSA's response to Sanders' question of whether members of Congress have had phone records or other data monitored "suggests the answer to that question was in the affirmative." The NSA has been the subject of scrutiny since former agency contractor Edward Snowden released extensive classified documents on various domestic surveillance programs last year. For his part, Sanders has introduced legislation that would prohibit the collection of phone records without a warrant, although it is unlikely such a law would make any progress in Congress. The NSA knows all . I don't care if they were listening in on my phone calls I'm not doing anything wrong but other people definitely would not allow it . I think it's good . Isn't the refusal to tell Congressional oversight committees what they're supposed to be overseeing a thumbing of the Executive Branches nose at the Legislative Branch? Defund the NSA surveillance state, call your reps now. The best shot to reel the NSA in is to defund them. Who in the Executive Branch would enforce that? So far this President is selectively enforcing laws to pander to loyalist and to be punitive to any who challenge them. BIG BIG BIG BROTHER LIVES AND IS EVEN STRONGER THAN EVER GROWING GOV. IN THE WORST POSSIBLE WAYS...watching planning ploting disrupting ruining lives all in secret...lying about everything as a guideing princable...No one is "more better". Censorship is in full effect now. The power that be has spoken. "NSA to senator: If we were collecting your phone records, we couldn't tell you"
Well, they just gave the lawmakers a law to make. It'll read "NSA must provide congress with phone records they collected on them. They can hide the records from the citizens of the US and other countries though". NSA... the new old CIA. The Powers that Be approve their Own work. I LIKE BERNIE HE IS PROBABLY THE ONLY HONEST POLITICIAN IN D.C. AND I CAN TELL YOU THAT WAS THE WRONG ANSWER THE GENERAL GAVE. What does make sense is that the stricter the collection oversight, the more apt collectors are to quit collecting anything – leading to risks for the American people. So even if "members of Congress and American elected officials" did not consider themselves a part of American society when they were giving NSA the permission to spy on each and every American, NSA simply may not have realized at the time that the political caste was so different! So it looks like the answer is 'yes'! BLOODY CHOCOLATES – BLACK LIKE OBAMA . SOLD BY FAMILY OBAMA, BUSH, BILLINGER MATURE CAMERON, ABE. You should all go to youtube and search for "30c3 To Protect and Infect" If you think you know how you are being watched you need to watch this. So they answer they way they do: "If we were spying on you, we couldn't tell you." A very educated guess at the true answer to the Senator's question might be inferred from this context. Obviously if they weren't spying on Congress they could say that they weren't! Whats funny is I don't truly think the NSA knows what their SPYING on', meanwhile 1500 more Illegals just jumped the border and will use stolen credit card numbers to go Shopping ! Well, since you have no idea of exactly what information they use, or how they use it, your opinion is baseless. Irrelevant ... if the NSA was after non americans it would matter ... NSA is only after everyday American Joe. Hey man don's spy on us Senators, we're the good guys (besides we don't want you finding out about all out liaisons with little boys and girls) only spy on.......everyone else!! Kinda funny that all you have to do is watch a TV show to know that one of the top rules of criminals is dont use the telephone. Or E-mail. Or text. We all know that's what Christie meant when he was railing about the stupidity of his subordinates. Unpopular opinion I imagine, but I'm glad the NSA is spying on congress. These congressmen/women have access to highly sensitive information that could be invaluable to our enemies in Russia/china and elsewhere. It is important for the government to know these people are trustworthy arbiters of this highly classified information, without agencies like the NSA this information could easily be sold for millions by traitors, as has been proven in the past. Thankfully no one IN the NSA could sell this information to bad guys. We can fully trust them to watch over us. Oh, wait! That meaningless argument could be used for anything. Who's watching the IRS? The FBI? Walmart? Your doctors office? Visa MasterCard ? The social security administration? They all have your information. I've had many dealings with the federal government over my lifetime with my business and can tell you they have always been even handed and fair compared to state government I have delt with. To each his own, I'd take the Feds any day of the weak. They have no axe to grind. Basically, all intelligence services are just a bunch of criminals. They all run the show, in collusion with enemies (their intelligence services), with no regard to their own law or to democratic values. Disrespecting own law is a sign of oppressive administrations, normal in case of communists, tyrants, and as is seen clearly, the USA. You are either naive or just want to spin things in their favour. Without help from intelligence agencies of USA, Pakistan and Saudi Arabia there would be no Taliban. They needed a foe, so they made one. That practice stems at least from good times of tzar's Ochrana. Probably will end the same way. Equally unpopular as well, you then must be glad that the NSA is spying on American citizens and non-Americans all over the world. After all, the world is a dangerous place and the USA has many enemies who would like nothing more than seeing its demise. The American government has an obligation to protect itself. Actually no. The The American government has an obligation to protect "The People" it serves. Or at least that's the way it's *supposed to be*. ALL meta data is monitored just like phone data. Every source and destination address, along with date is entered into the mega data base of the FBI/NSA. The NSA should be dismantled and done away with. I would rather a terrorist stole my life than have my government steal my freedom. When did we become to weak, so afraid in this country that we would allow this to happen? Our vets die for our freedoms so the government can take them away one by one. Well Senator, join the club, along with the rest of the U.S. citizens, world leader and anyone else the nsa wants to spy on. This administration is so far out of hand and contrrol ! No wonder experts are saying that in the future the obama years will be known as the criminal years! When will we have had enough?? If you're going to post on a topic, please at least be informed. The NSA was engaged in its current practices under Bush as well. Gee, why weren't the Republicans complaining then (Congressional members are cleared to NSA programs). And before you jump to conclusions, Obama will go done as the worst president in American history. Even Nixon accomplished more for America than Obama. WE THE PEEP-HOLE. . . . .
....and that is precisely the point at which any governmental agency has just declared itself in dire need of being eliminated. Actually the NSA answer makes perfect sense if you understand the restrictions that they operate under. They can not access a name associated with a specific phone record without a FISA court order and a valid intelligence need. They can not answer Sanders question any more directly. Things are not as sinister as people think. But therein lies the problem as well...it is not difficult at all to plug a phone number, or any other metadata for that matter, into Google Search with a few filters and determine that information. There's really no valid protection there. Anyone who doesn't know how a database works, isn't going to understand that the NSA looking at your phone number is the least of your worries..
HOOOORAY! An informed lucid comment! Sanders letter was nothing more than a PR stunt. He knows, or at least should know what the NSA can and can not say in public. He could have also made a request through secure channels and might have gotten a better answer. But no, like all the d-bags in DC he wants to grab attention. Again, Bessie, nice insightful comment. Would you be interested in a plot of land with a view of the sea of tranquility? You are horribly naive. No, the NSA does not need a warrant from the FISA court. They SHOULD ask for one. But as long as the data is collected AT the NSA, it is accessible, and the FISA court is not there to look over every NSA operator's shoulder 24/7. It is a peace of cake to access the data, and the fact that they have been tracking lovers etc. shows how much abuse happens. Classic doublespeak. They are busy trying to protect us from ourselves. We're all guilty until proven innocent now, better get used to it, proles! Bullplop. If a g'damned SENATOR cannot get out of them whether they are targeting him or not..... The sheer arrogance on the part of the NSA is mind-boggling here. It turns out France was right. Thank Obama for continuing and expanding it...I don't like either one, but Bush stopped serving two terms ago. Obama had plenty of opportunity to dismantle it. "Alexander did not offer any further details about members of Congress specifically, arguing that doing so would require him to violate the civilian protections incorporated into the surveillance programs." I thought they were trying to protect civilians with the spying to root out terrorism? Do they suspect Congress members of terrorism? What kind of country is my grandkids going to inherit? Ignore the Bill of Rights? Sounds like J. Edger and Nixon. Guess we may as well say you have no 4th Amendment Rights. What is next, ignore the 5th Amendment rights unless you are an Obama appointee? Maybe there's something to what you say? If Congress won't burn down the national debt, might the NSA have quiet little one on one's to show them the error of their ways? The NSA doesn't care about debt. they only care about self preservation and growing their agency. "We can tell you, but then we would have to terminate you with extreme prejudice," said NSA rep.
and this is a surprise to who? So who is watching the watchers? And meanwhile the Russians and Chinese, with lesser intelligence-gathering tools and lesser moral qualms about pursuing aggressive, self-interested agendas gain a little breather. In other words they're doing many other things they're never going to tell anyone about. This is another example where the Government ignores the People; spies on them; and uses that information for business and/or geo-political goals! Time to eliminate that mission, and cut their budget in half. These are not glorious troops – but pathetic Stalin-police state efforts! You obviously have no clue what you're talking about. The NSA has not been accused of spying on any Americans, nor has it been found to be conducting operations beyond its legal authority or in the absence of FAISA oversight. Remember all the brouhaha over the Patriot Act? Or maybe you weren't paying attention which is why your hand wringing now. And the reference to Stalin was pathetic. I mean really, you're trying to strike a comparison between the United States of America and Joseph Stalin! The man responsible for the death of something in the neighborhood of 40 MILLION people! Really! Go back to sleep and please never vote or have children! I guess you missed that part a few months ago where NSA employees were found to have been tracking lovers. Hmmmm. Given that the data is available, and given an NSA rep could easily dummy up some sort of "we think this guy might be dirty because he was talking to somebody else with think might be dirty" warrant request, I'm betting FISA hasn't always been effective as a watchdog. In theory...sure. In practice....erm, not so much. Unfortunately it is alright with congress if the common man gets checked on, but not the privileged class. Good question. Allowing it to expire would make this a somewhat more reasonable question to be asking. Please explain how the "common man gets checked on" what ever that means. Have to admire you guys being able to drum up a question of IF when the answer is already there if you know where to look. Meanwhile everyone argues about the question instead of the answer we had first.